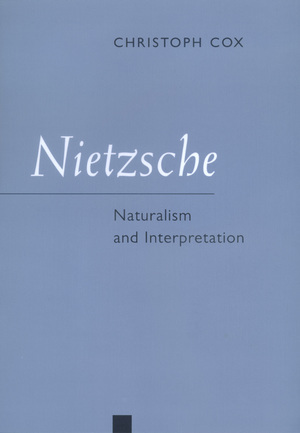 Nietzsche: Naturalism and Interpretation offers a resolution of one of the most vexing problems in Nietzsche scholarship. As perhaps the most significant predecessor of more recent attempts to formulate a postmetaphysical epistemology and ontology, Nietzsche is considered by many critics to share this problem with his successors: How can an antifoundationalist philosophy avoid vicious relativism and legitimate its claim to provide a platform for the critique of arguments, practices, and institutions? Christoph Cox argues that Nietzsche successfully navigates between relativism and dogmatism, accepting the naturalistic critique of metaphysics and theology provided by modern science, yet maintaining that a thoroughgoing naturalism must move beyond scientific reductionism. It must accept a central feature of aesthetic understanding: acknowledgment of the primacy and irreducibility of interpretation. This view of Nietzsche's doctrines of perspectivism, becoming, and will to power as products of an overall naturalism balanced by a reciprocal commitment to interpretationism will spur new discussions of epistemology and ontology in contemporary thought. Christoph Cox is Assistant Professor of Philosophy at Hampshire College.